With golden coasts, striking blue waters and lush green landscapes, Greece wows visitors who want to spend quality time away from it all. Many travellers also come to Greece for its charming traditions and picture-perfect historical sites. Whether for sightseeing or cultural exploration, this Mediterranean paradise is sure to tick the boxes for an unforgettable holiday. Naturally, any memorable adventure begins with a great villa. This year, discover the dreamiest villas in Greece so you can choose your home away from home with confidence. For all the beauty Corfu offers, Corfu Imperial goes a step further. This private haven on the Ionian Sea stretches across a private peninsula. And for those who want as much luxury as possible, the grand resort’s waterfront villas will not disappoint. For starters, these extravagant villas offer private pools, generous living spaces and separate sleeping quarters. The unique interior décor effortlessly mixes classic Greek spirit and modern amenities, combining regal palettes with hand-carved wooden headboards and hand-painted murals. Each villa overlooks the sea while shaded verandas surrounded by tropical gardens lead to the shore. Secluded coves and sandy beaches provide peace and quiet in an unspoilt location, with Corfu Town only 12 kilometres away. This year, Corfu Imperial has been remodelled with sophisticated lounges, waterfront restaurants and bars, and a new Grecoland Kids Club. To top things off, the property’s soothing atmosphere makes it easy to enjoy folklore shows, live music, gourmet cuisine and revitalising Elixir Spa treatments. Winner of Greece’s Leading Luxury Hotel Villa at the World Travel Awards for the past three years, Mykonos Blu is as renowned as it is magnificent. Tucked away on the famous Psarou Beach, the resort is a sanctuary for the senses. 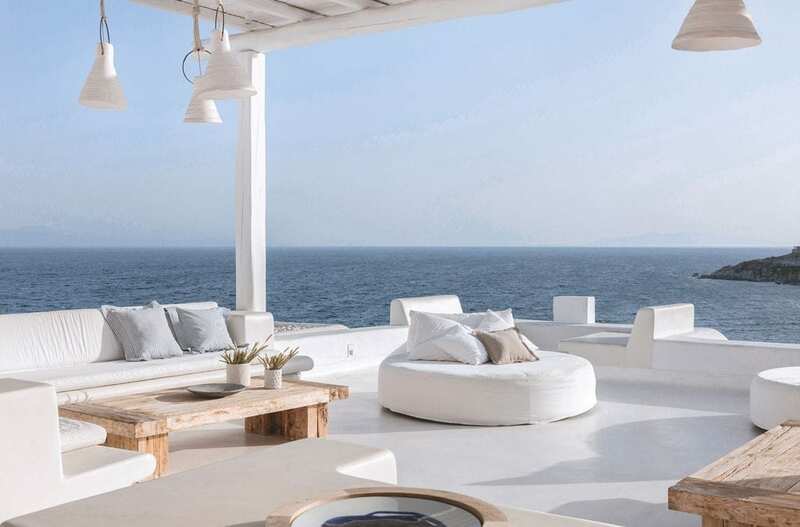 In the Royal Blu Mansion, deep blue and white décor complements dramatic views over the Cyclades. Ideal for entertaining small or large parties, the mansion allows scenic views everywhere you look, from the entertainment parlour and airy lounges to the bedroom suites with spacious furnished terraces. What’s more, a personal butler is at your service 24/7. After a night of partying, the spa provides a wonderful way to relax and refresh. Pamper yourself with a sauna session before enjoying your treatment of choice. Elixir Spa therapists can also arrange massages, therapies and beauty treatments in the privacy of your villa or outdoors by your pool. When it comes to fine dining, feast in the comfort of your private villa or indulge in local delicacies while admiring the bay views. Then sail away on the Aegean Sea in a private yacht. Inspired by legendary Cretan hospitality, Amirandes is the avant-garde of luxury and sophistication in Greece. Set amid landscaped gardens and palm-fringed lagoons, this five-star resort combines cosy villas with breathtaking views, impeccable services, exceptional dining and a host of family-friendly activities. The Amirandes Creta Villa is set in an elegant courtyard and a private terrace overlooking the horizon. The ground floor entrance hall opens to a spacious living area that can be converted to a bedroom for two children. Panoramic glass doors lead onto a lavish sun deck, a sunken lounge and dining area, and a private, temperature-controlled infinity pool that seems to melt into the deep blue. On the airy first floor, the master bedroom exudes refined elegance with wooden floors and stone elements. Meanwhile, the luxurious bathroom, dressing area, state-of-the-art basin, and private sea view balcony beckon for romantic breakfasts or late night drinks. For families, Amirandes offers an abundance of activities and sports facilities, including three tennis courts, a watersports area, twice-daily beach volleyball and a Golf Academy. The hotel’s entertainment team also offers a variety of activities, from live music and dance shows to pool and beach parties, an outdoor cinema and Cretan folklore evening. 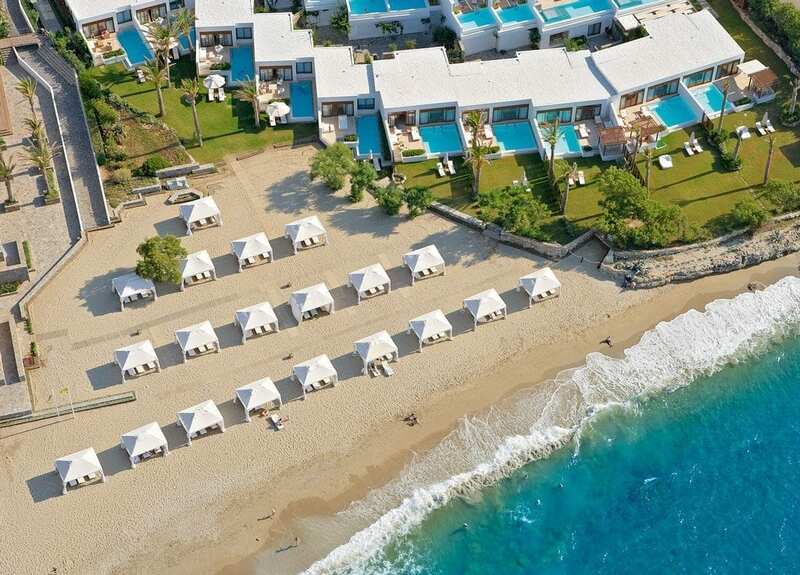 Nestled on a prime beachfront estate in the heart of the Cretan Riviera, Caramel combines the laid-back ambience of an island settlement with the flair of a modern luxury resort. 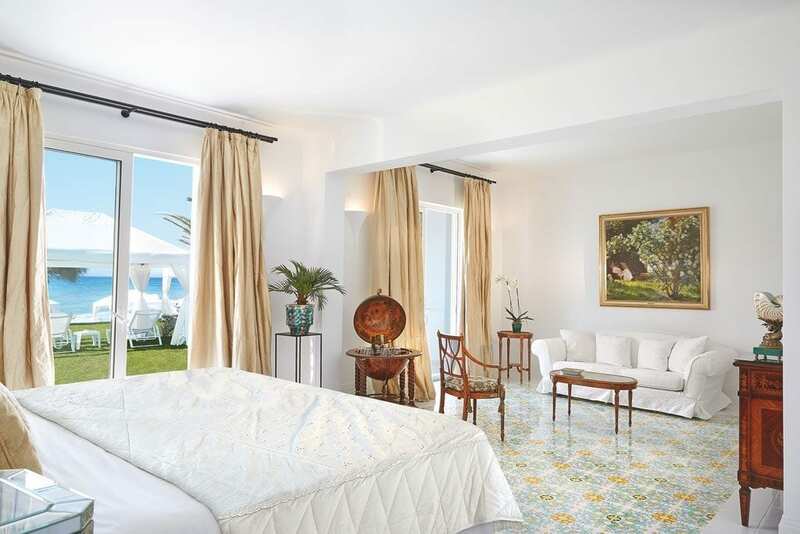 In the 4 Bedroom Villa on the Beach, guests can expect total luxury. Designed in a village bungalow style, it offers 165m² of living space on two levels. The ground floor features luxurious lounges, open-plan living and dining areas, and the upper flower benefits from individual access to spa-inspired bathrooms. King-sized beds set near large glass doors enjoy direct views over the Cretan Sea and Rethymno Town. Outside, spacious verandas and outdoor lounges are ideal for relaxing. Located in a convenient, yet private location within the resort, this villa makes a great choice for large gatherings. Other world-class facilities at Caramel include a full gym, a beauty salon, an airy restaurant serving Mediterranean and international dishes, an outdoor pool with an adjacent outdoor eatery, and a piano bar. At Cape Suonio in Athens, sumptuous suites and villas meet discreet, intuitive service to make your honeymoon a once in a lifetime experience. And the Honeymoon Villa with Private Pool is ideal for newlyweds. Overlooking the Temple of Poseidon, this villa displays a romantic palette of nature’s richest colours: bronzes, golds, greens and blues. Outdoors, a private pool in the shaded garden lies surrounded by olive and pines trees. A few steps away, fragrant bougainvillea and jasmine frame the arcaded buildings and landscaped grounds. To make your honeymoon even better, the five-star resort boasts secluded beaches and gourmet dining on the water’s edge. Enjoy a dinner for two under spectacular sunsets, whether at the Mediterranean à la carte restaurant or Greek, Asian and seafood eateries. 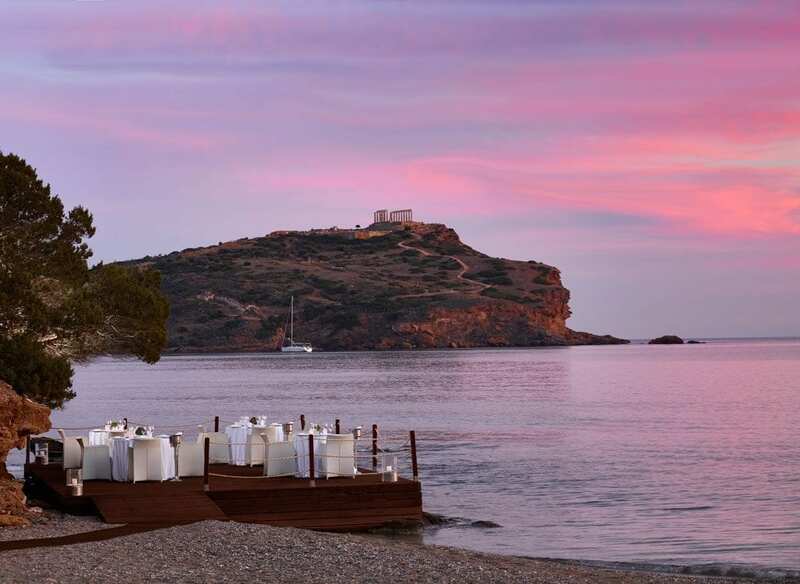 With its convenient location only 45 minutes from Athens International Airport and an hour from Athens, Cape Sounio makes it easy to sightsee, shop and explore the Athenian Riviera during your stay. To book your 2018 holiday, visit grecotel.com.